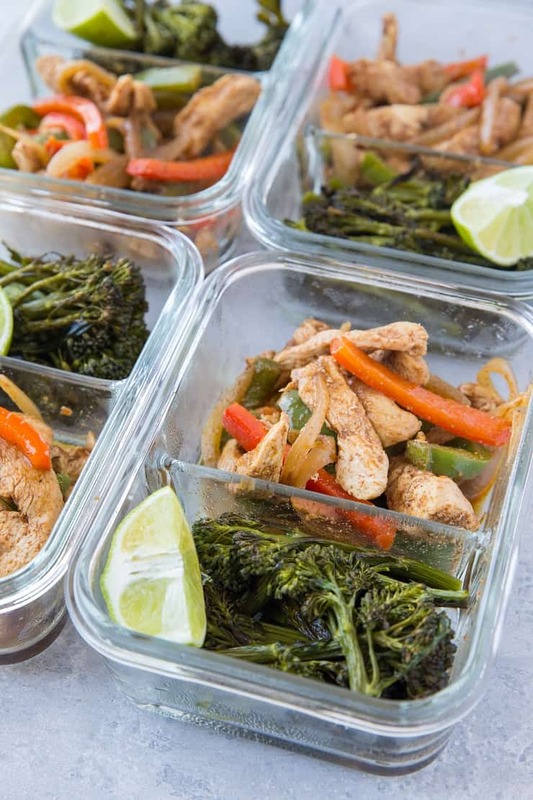 Quick and easy chicken fajita meal prep bowls with roasted broccolini. 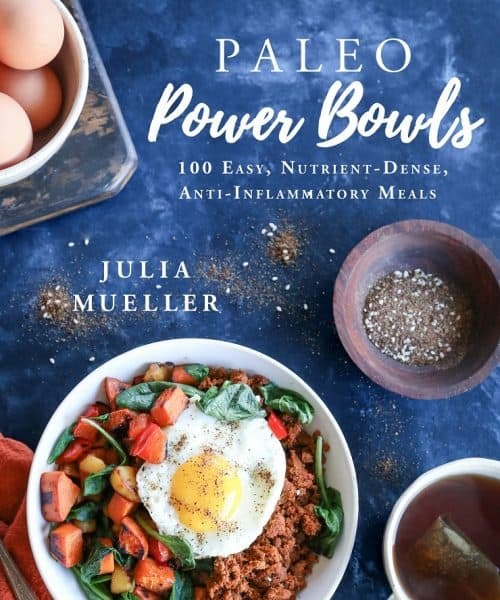 This fresh and clean recipe is keto, paleo, whole30, and low-carb and will keep you energized throughout your workday. Lunch. Talk about a challenging meal! Most of us eat lunch at work, which can become challenging when we feel we don’t have adequate time to plan ahead to bring a proper meal. Eating out can mean overly heavy and/or carb-laiden meals that ultimately cause loss of energy in the afternoon. 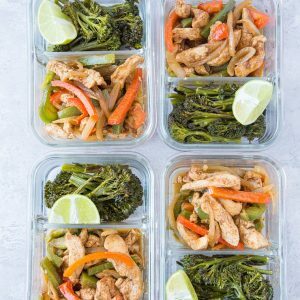 I know many of you are turning over all sorts of leaves so I thought I would try to be of some service and offer up meal prep recipes that you can make ahead super quickly and take to work..or wherever you may be going….Or maybe you work from home (like me) and still meal prep (unlike me…palm-to-face). 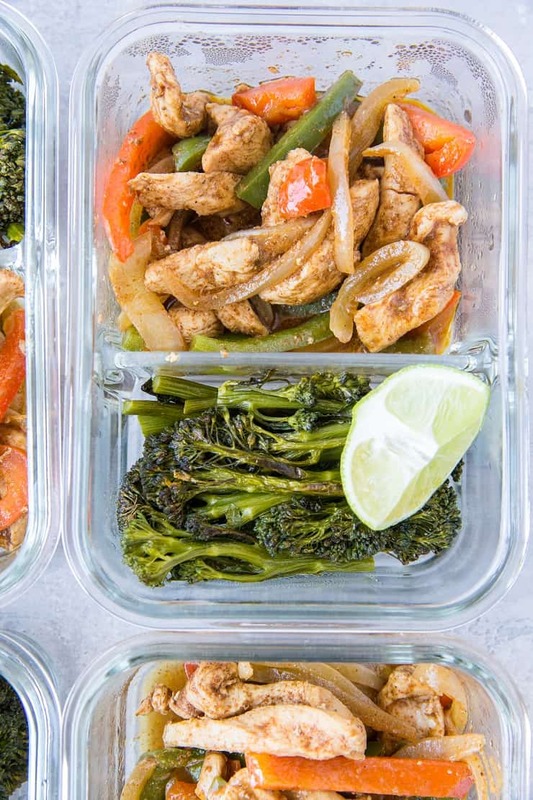 For those of you who enjoy meal prepping, these super quick and easy Chicken Fajita Meal Prep Bowls are crazy-convenient. First, they require only a few basic ingredients, yet are HUGE on flavor! Second, the recipe takes less than 30 minutes to make from start-to-finish. Lastly, fajitas are incredibly versatile! The chicken, pepper, and onion mixture is usually stuffed into a tortilla for a taco situation, however, you can do anything you please with the meal. You can eat it with rice (my personal choice), sauteed or roasted vegetables, or quinoa. 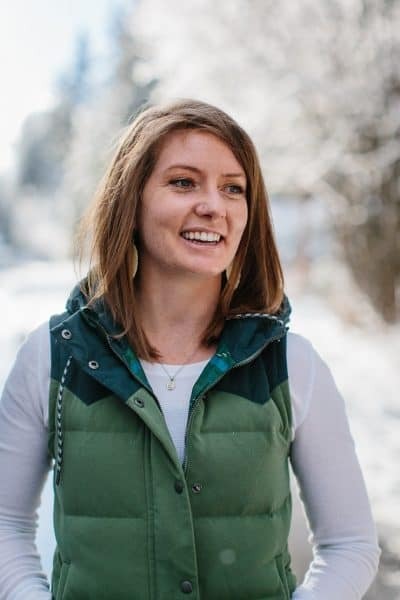 I chose to keep these meal prep bowls low-carb because I realize many folks are either doing a stint of keto, whole30 or paleo this time of year. In general, I find eating a great deal of carbohydrate in the middle of the day causes my energy level to plummet toward 2-3pm. For this reason, I am cognizant of the amount of carbs I eat past a certain time of the day so that I don’t lose my momentum. So rather than going the traditional tortilla route, I simply include roasted broccolini in the bowls. Change this up as you like (see Recipe Options below). All this to say, I’m a huge fan of the concept behind these fajita meal prep bowls. 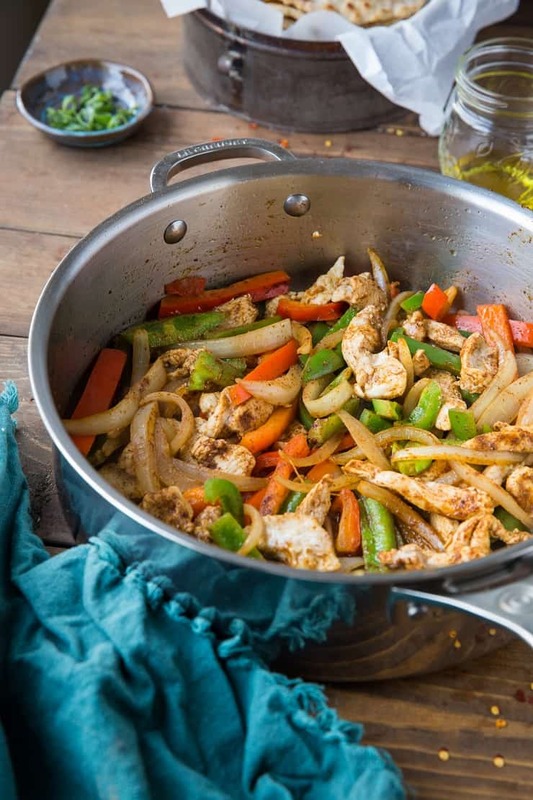 If you’ve made my 30-Minute Chicken Fajitas, you’re already familiar with the concept! -> Lightning quick, easy to make in bulk, doubles as dinner if you don’t get to it for lunch, won’t cause you to fall asleep at your computer. All you do to prepare this recipe is cook the onions, chicken, and peppers in a skillet (I use a big, deep stainless steel skillet) and roast the broccolini. If you prefer to saute your vegetables, you can absolutely go that route instead of roasting! 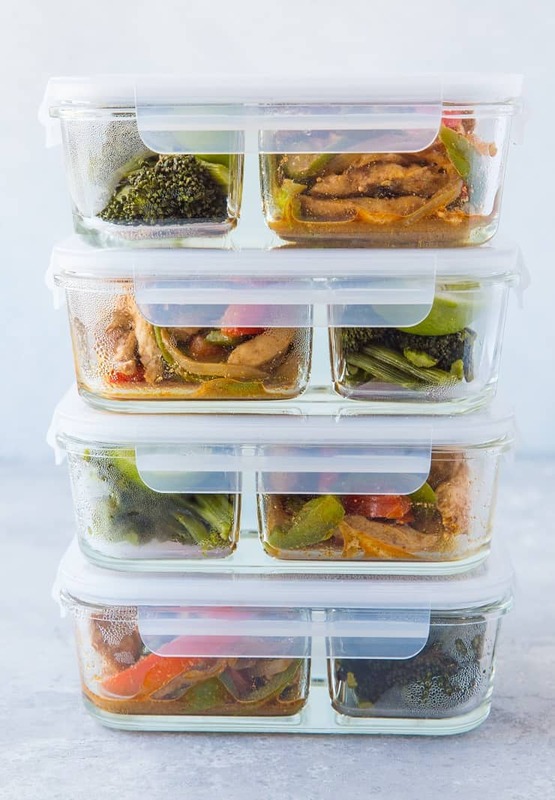 Once the fajitas and broccoli are finished cooking, allow them to cool, put them in your meal prep containers (I use these Glass Meal Prep Containers I found on Amazon), seal them up, and refrigerate. Snag one in the morning to bring with you to work, and you’re set! Incorporate white or brown rice into your bowls for some added carbs. Add roasted carrots, butternut squash, or sweet potato for non-grain carbs. Bring corn or flour tortillas (or homemade Cassava Flour Tortillas if you’re grain-free!) with you to wrap up the chicken and peppers. Make a batch of Crowd Pleasing Roasted Vegetables or My Easy Go-To Stir Fry Vegetables to take with. The recipe makes enough for 4 lunches, provided you bring a snack or two or also bring rice, beans, and/or tortillas to go with the fajitas. Start by preparing your broccolini. Saute or roast 2 bunches of broccolini in 1 tbsp avocado oil. To roast, preheat the oven to 415 degrees F, toss the broccolini in oil and sea salt, then roast on a baking sheet for 20 minutes. To saute, heat the oil in a large skillet over medium and add the broccolini and sea salt. Cover and cook 3 minutes, until broccolini is bright green. Remove the lid and continue cooking until broccolini reaches desired doneness, about 2 to 5 minutes. While the broccolini is cooking, prepare the fajitas. 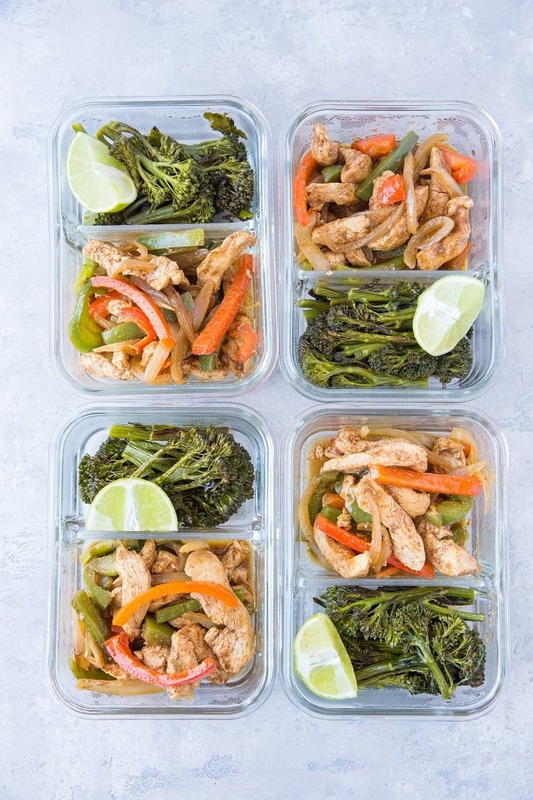 Allow broccolini to cool before transferring it to your meal prep containers. Heat the avocado oil in a large cast iron or stainless steel skillet over medium heat. Add the onion and saute, stirring occasionally, until onion is transparent, about 5 minutes. Add the remaining ingredients and stir well. Cover and cook 2 minutes. Remove the lid and continue cooking until some of the juices have burned off and chicken is cooked through, about 5 to 8 minutes. Allow this mixture to cool so that you can transfer it to your meal prep containers. Winner! I love this idea. Finding pre-made meals to take to work from the grocery store is a challenge. Only one or two frozen meals meet my diet needs and are boring. I love this post and will make mine this weekend. Which glass containers are those? I maybe missed your link to them. This looks amazing! I love the idea of making lunch ahead of time for the whole week. Especially when it looks this delicious!